During its transition from racial apartheid to democracy in 1994, South Africa’s government announced it would strengthen the tenure rights of the estimated 16 million citizens who lived on communal land. By 2012, however, the government’s own reports concluded that the country had made little progress in the area of communal tenure reform. Moreover, decision-makers wrestled with how to handle the hundreds of thousands of people who had moved to shanty towns on city outskirts—and to regularize the rights of people who once had formally recognized individual tenure but unwittingly undermined the security of their claims by passing land “off the register” to family members or other members of their communities. South Africa’s predicament embodies the kinds of land tenure and property rights challenges many countries confront today. 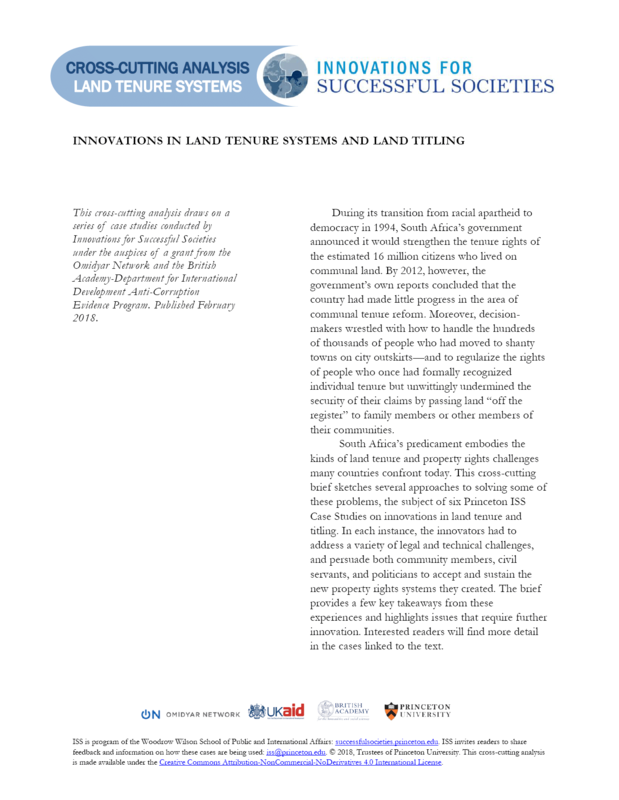 This cross-cutting brief sketches several approaches to solving some of these problems, the subject of six Princeton ISS Case Studies on innovations in land tenure and titling. In each instance, the innovators had to address a variety of legal and technical challenges, and persuade both community members, civil servants, and politicians to accept and sustain the new property rights systems they created. The brief provides a few key takeaways from these experiences and highlights issues that require further innovation. hartered in 1746 as the College of New Jersey — the name by which it was known for 150 years — Princeton University was British North America’s fourth college. Located in Elizabeth for one year and in Newark for nine, the College of New Jersey moved to Princeton in 1756. It was housed in Nassau Hall, which was newly built on land donated by Nathaniel FitzRandolph. In 1896, when expanded program offerings brought the College university status, the College of New Jersey was officially renamed Princeton University. The Graduate School was established in 1900. The British Academy is the UK’s national body for the humanities and social sciences – the study of peoples, cultures and societies, past, present and future. We have three principal roles: as an independent Fellowship of world-leading scholars and researchers; a Funding Body that supports new research, nationally and internationally; and a Forum for debate and engagement – a voice that champions the humanities and social science.